Reliable, easy-to-access communication always within arm’s reach! 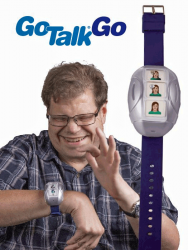 The rechargeable GoTalk Go offers three programmable message buttons. Try the new easier-to-use capacitive touch buttons to activate a message. Program 1, 2, or 3 messages on each of three levels for a total capacity of nine messages! Wear it like a watch, with the plastic or fabric wristband (both included), for communication always at your fingertips! The robust volume of this device will amaze you. Great to use for conversations in the cafeteria, at recess, on community outings, and many more places.